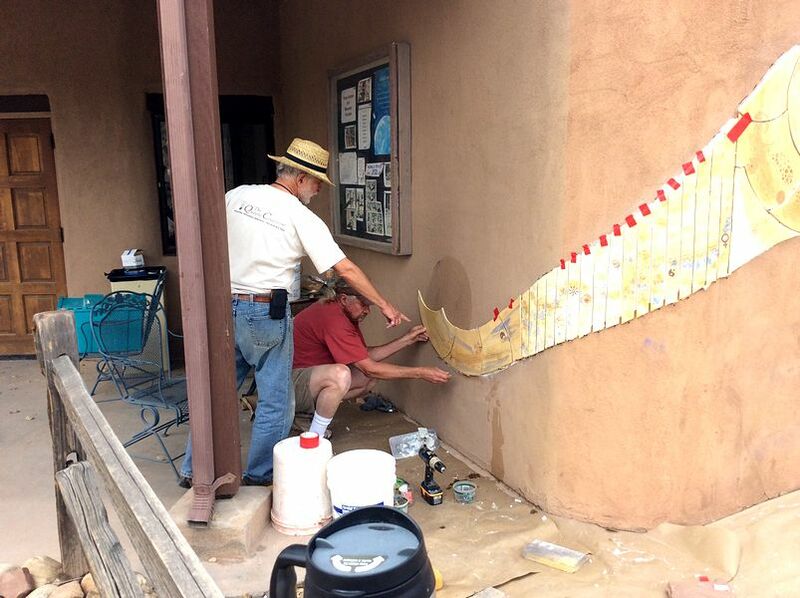 The River of Peace Mural is a 35 foot ceramic tile mural on the East outside wall of the Lower Pavilion at Ghost Ranch, facing the Peace Garden. 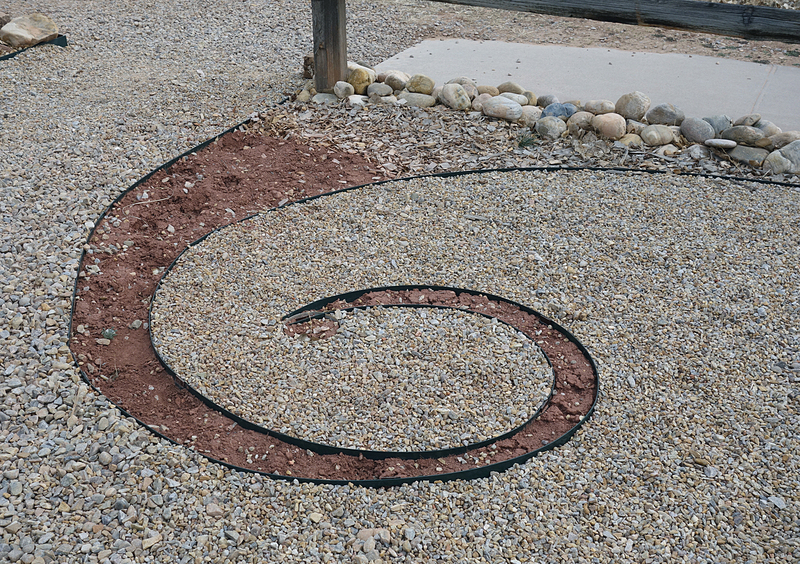 The mural shape echoes the Fibonacci curves contained in the layout of the Peace Garden. 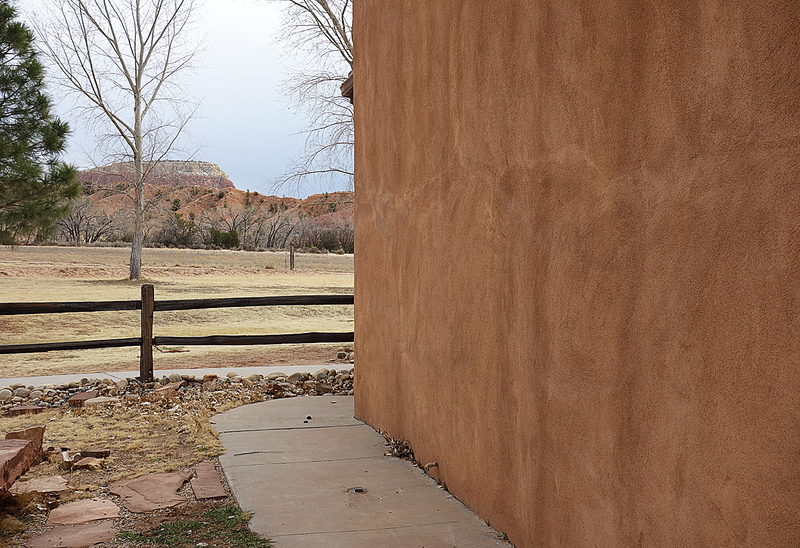 Clay slips in natural hues on the tiles relate to the colors of the rocks, sky and earth at Ghost Ranch. 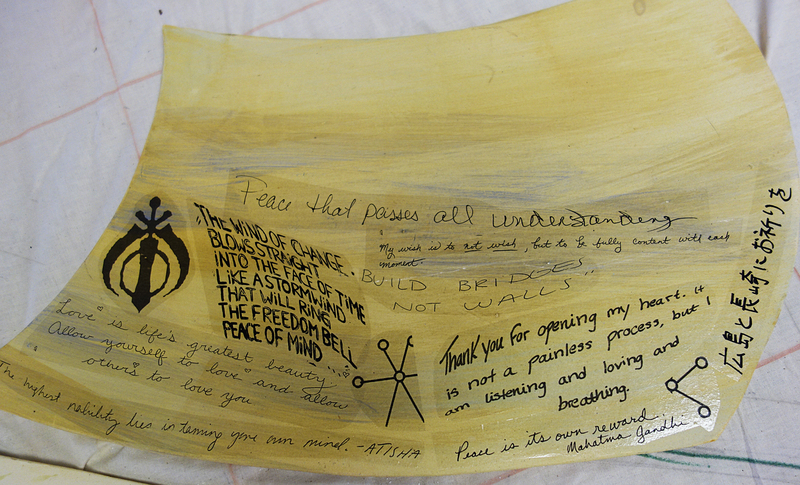 Permanently fired into the surface, a visual river of spiritual symbols from around the world is integrated into a mosaic of hand-written poems, prayers, intentions, quotes and original writings. 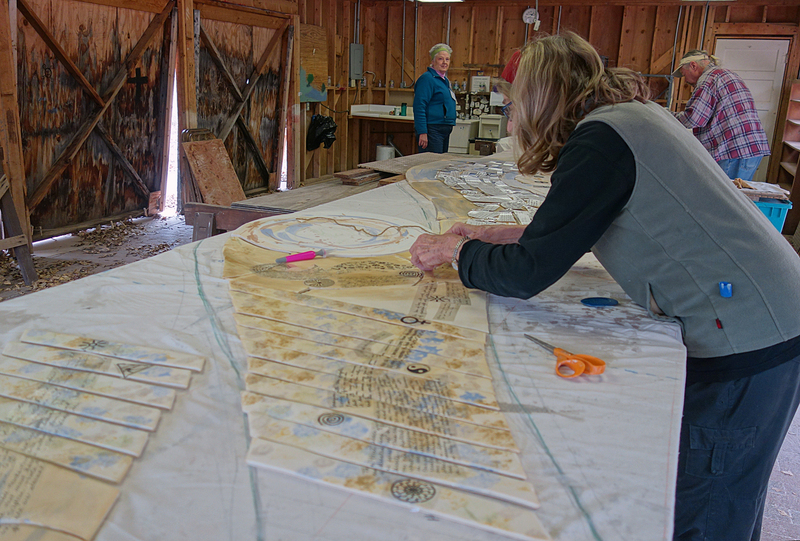 Because of widespread interest in the mural and the participation of the community, Barbara Campbell and Judy Nelson-Moore decided to create 6” tiles using the methods and imagery from the River of Peace Mural. 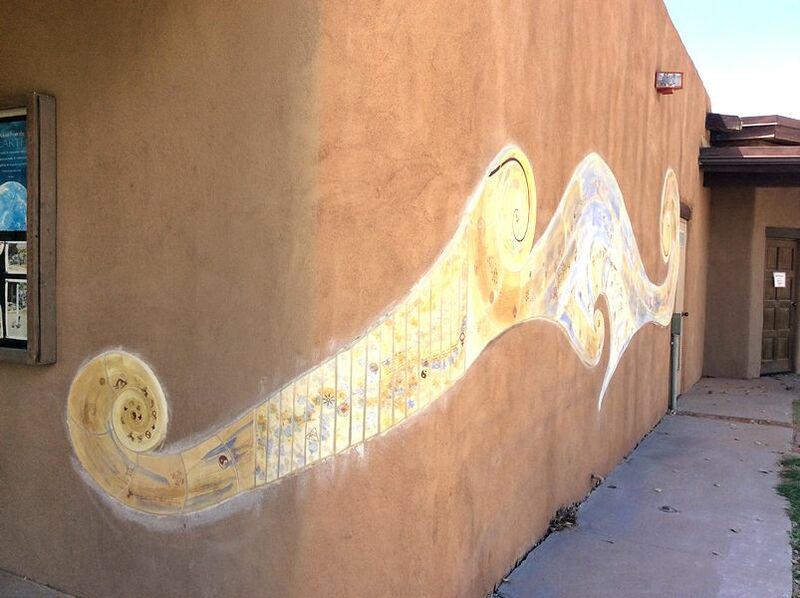 This is a way for people to have a “piece of the Peace Mural” to take home. These tiles are all unique and made by hand. 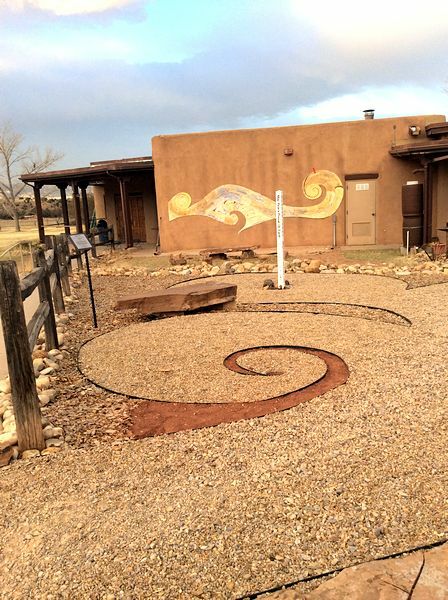 They provide a lovely remembrance of the mural and Ghost Ranch. 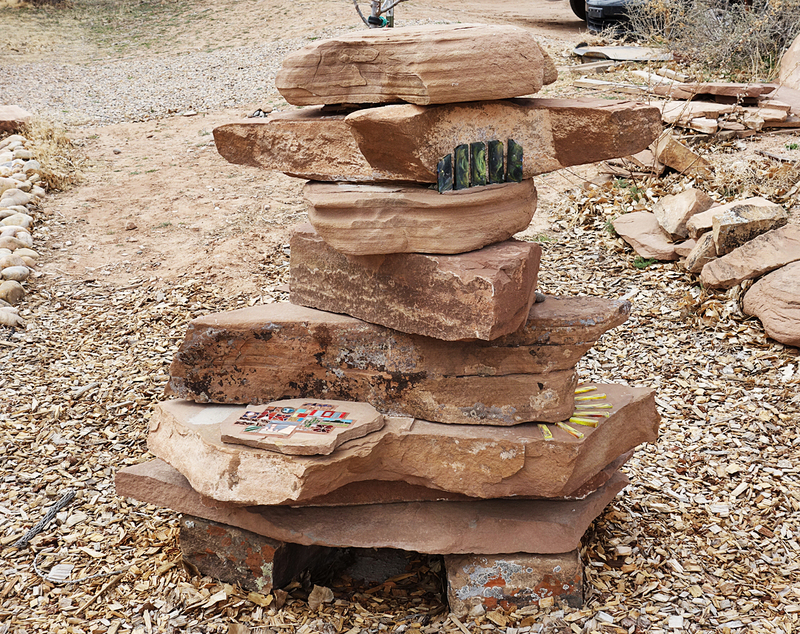 All profits benefit the ceramic studio in Pot Hollow at Ghost Ranch. 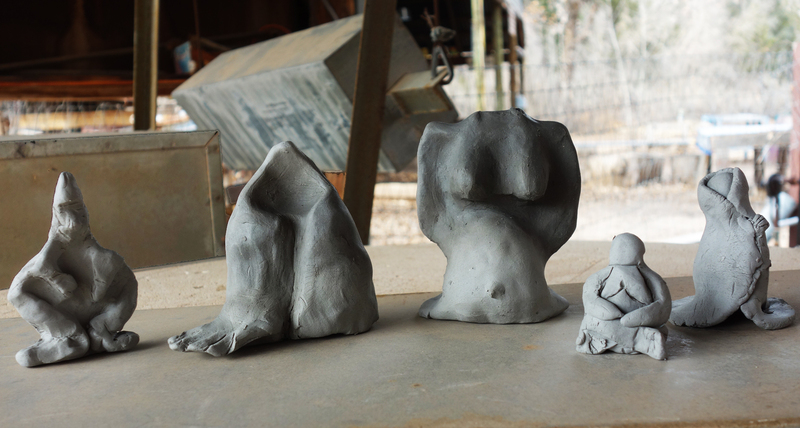 This studio has been providing a place for clay exploration and learning for over 45 years. 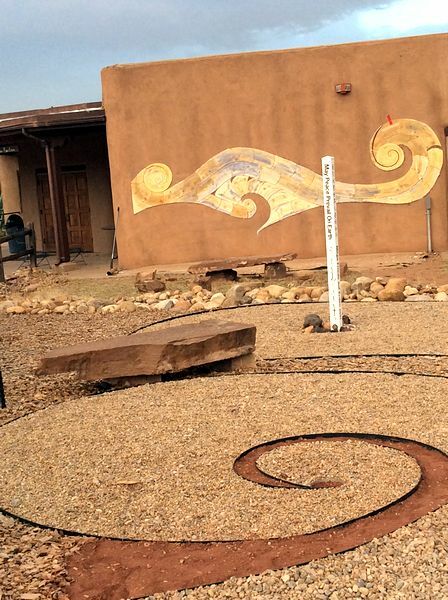 Your purchase of this tile supports the Ghost Ranch workshops as well as clay workshops and activities of the New Mexico Potters and Clay Artists in Pot Hollow. 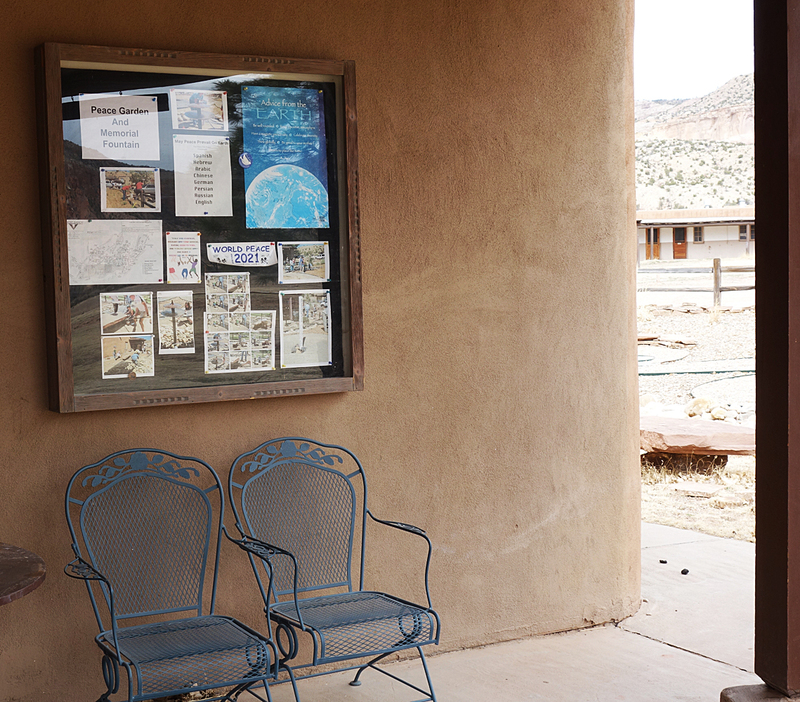 Tiles are $18 and are available in the gift shop at the Ghost Ranch Welcome Center. 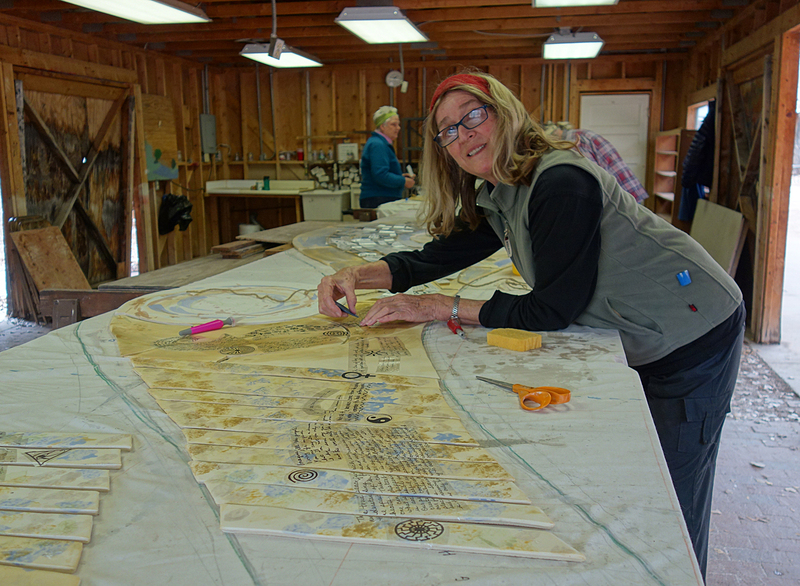 Barbara Campbell and Judy Nelson-Moore are making tiles, based on the River of Peace mural, to be sold in the Gift Shop. 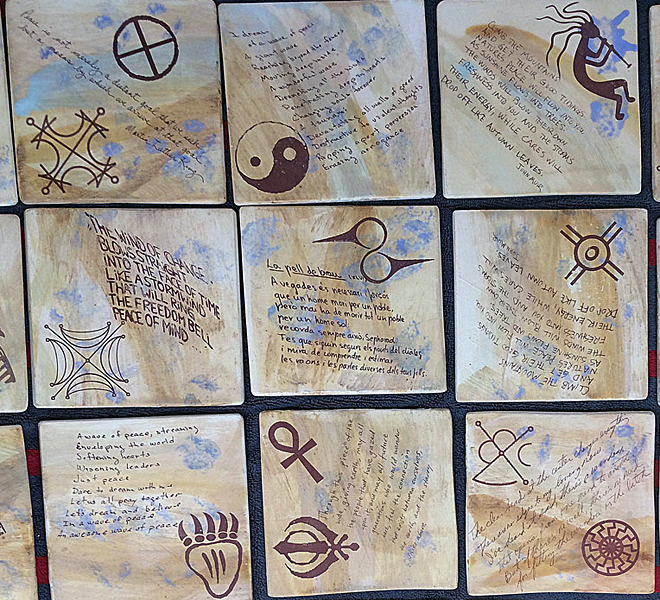 Proceeds from these 6″ x 6″ tiles will benefit the Pot Hollow ceramics studio. Look for availability announcement in mid June, 2014. 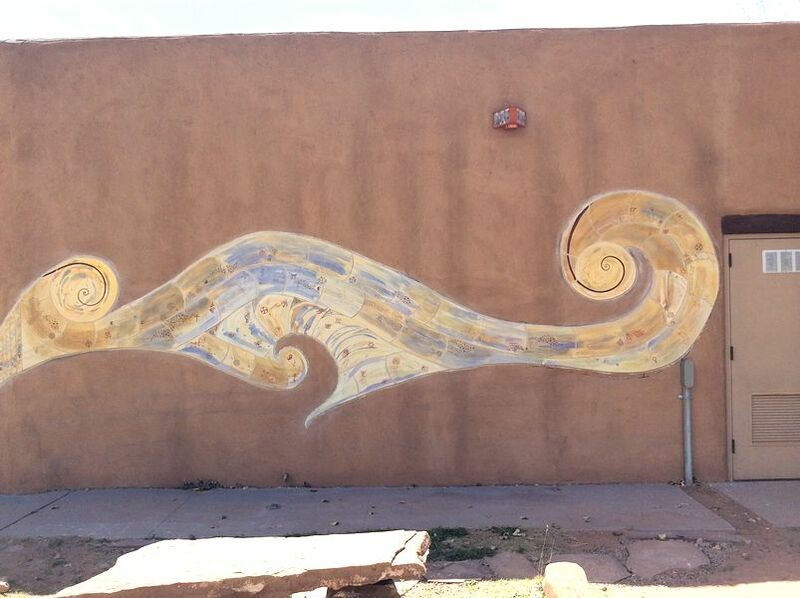 The weekly newspaper, Rio Grande Sun, has published an article about the Peace Mural this week (April 24, 2014). 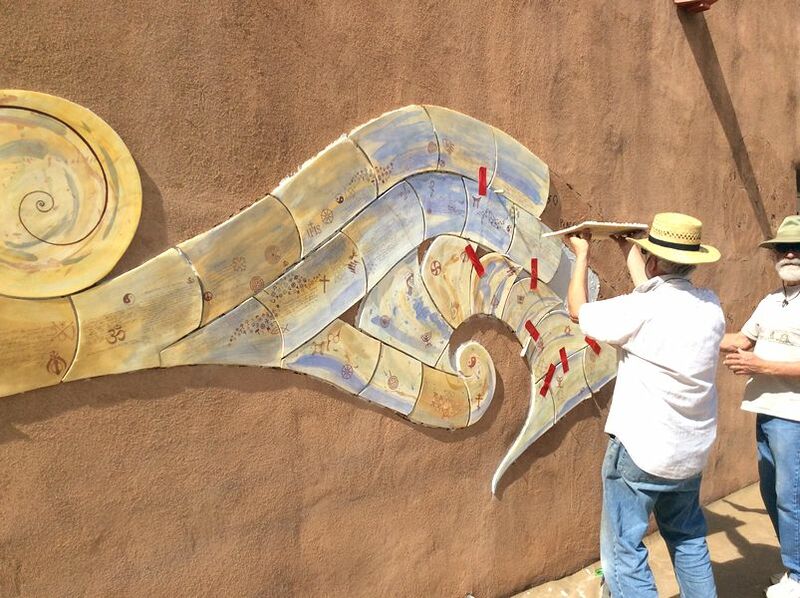 Written by arts editor, Bob Eckert, the article talks about how the mural came to be, some of the stories, and shows pictures. Here is a pdf of the article. 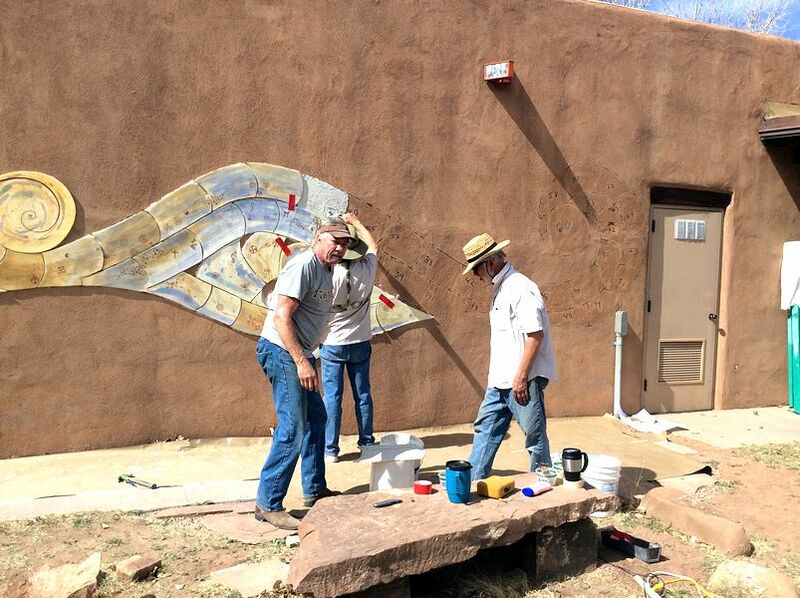 Here are some pictures of the final installation of the River of Peace mural in the Peace Garden at Ghost Ranch. 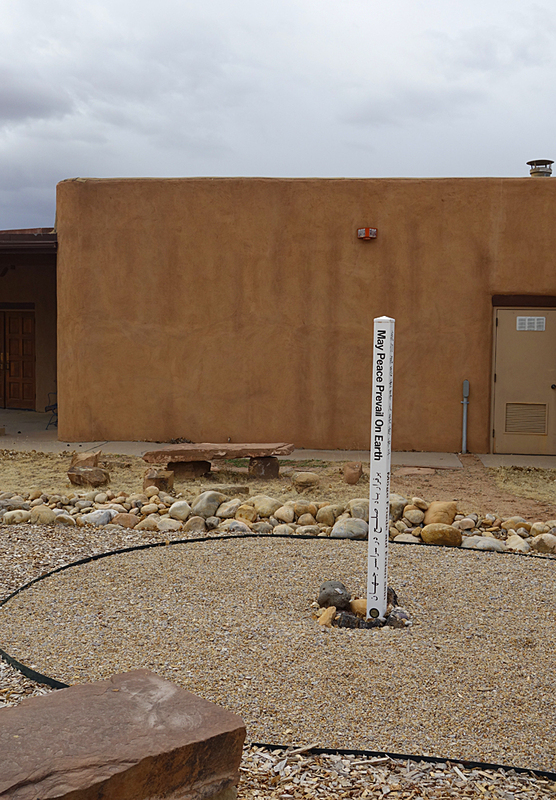 Present for the installation were Barbara Campbell, Judy Nelson-Moore, Dean Schroeder and Tomas Wolff, all members of the NMPCA. 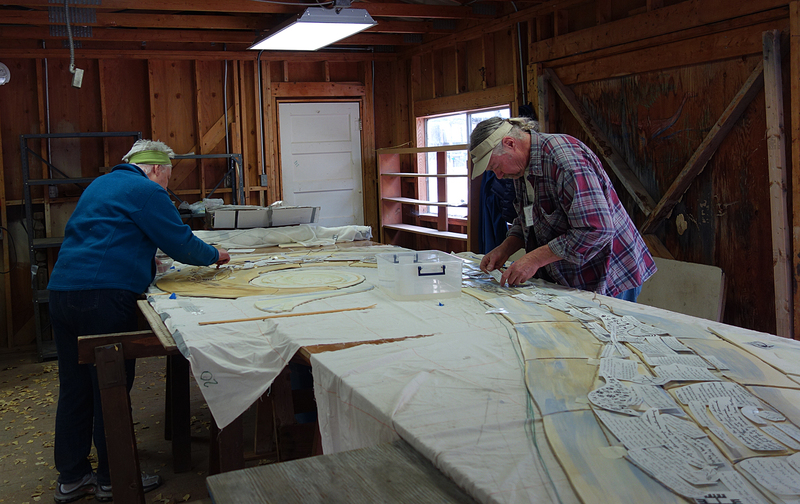 Also assisting were Tom Nichols, original designer of the Peace Garden, and his wife Edie. 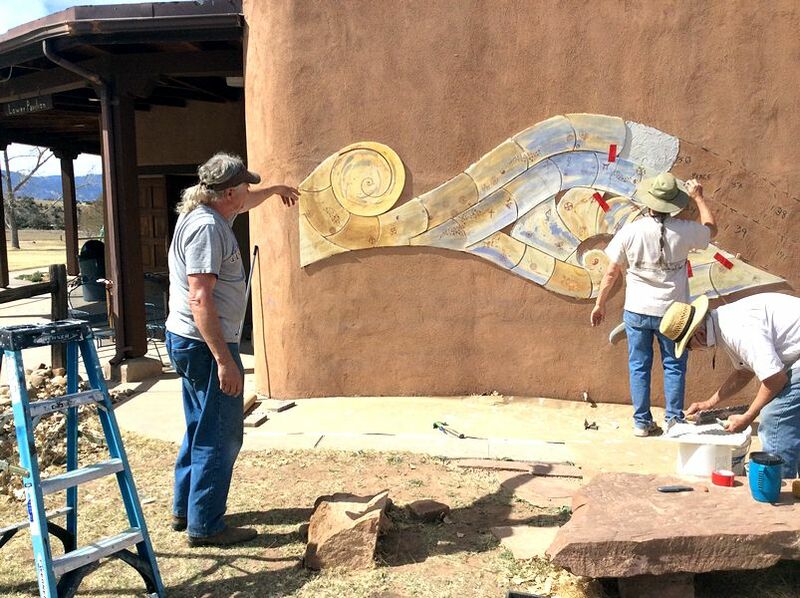 Barbara Campbell, Tomas Wolff, Dean Schroeder, and myself, Judy Nelson-Moore are at Ghost Ranch through Sunday installing the Peace Mural on the wall. It is exciting to have this project started last year and contributed to by so many people come to fruition. 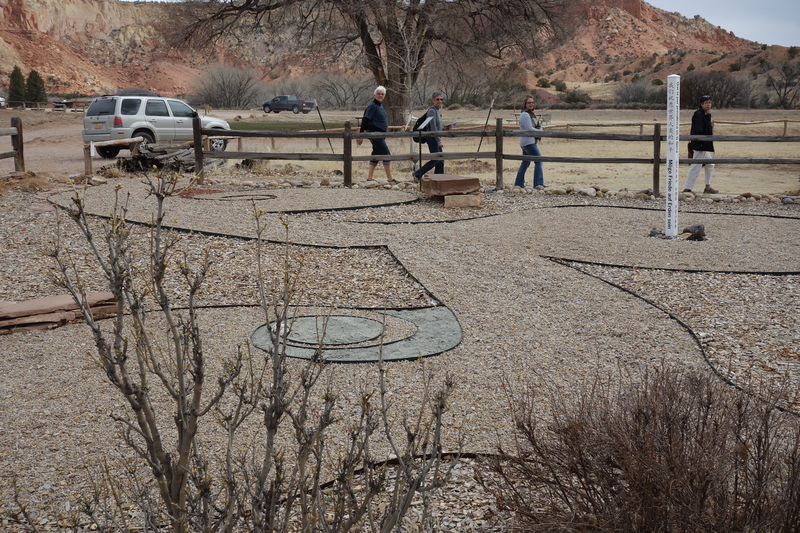 Yesterday, they were also filming a movie at the ranch…total chaos! Tom Nichols and his wife, Edie, are also here to help. 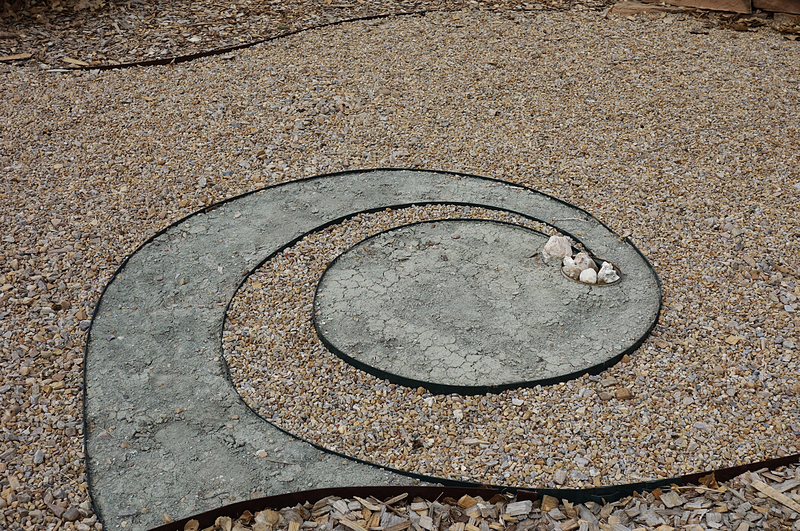 Tom is the original designer of the Peace Garden. I’ll post pictures soon, but I wanted to tell of two terms I coined during yesterday’s work: Squizzy and “Think like a shrink”. Squizzy is what you do to adjust the placement of the tiles. Sort of a squeeze with an attitude…wiggle, twist…you get the idea. Think like a shrink refers to the fact that the clay tiles shrink during the drying and firing process, which all clay people know. When you have many different shaped tiles over 26-30 feet, the way in which they shrink is not regular and behaved, like it would be if the tiles were all the same size and shape. 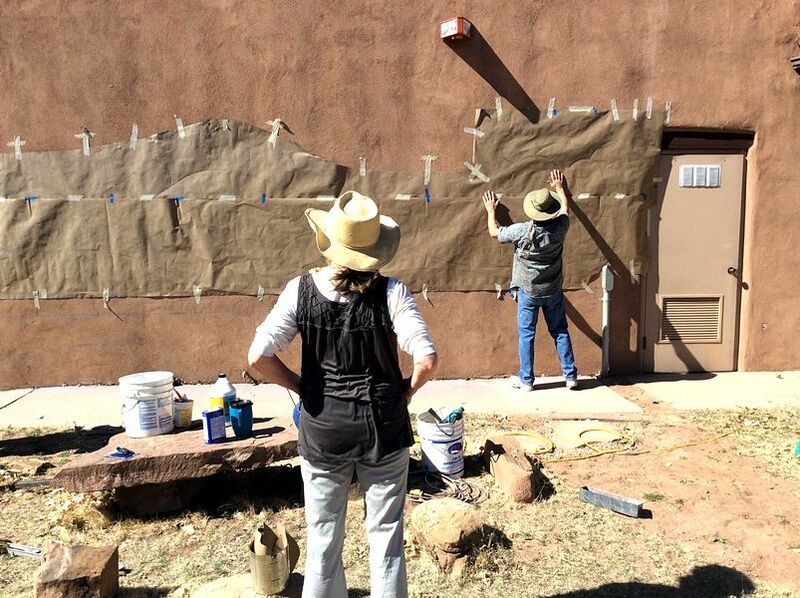 So, it takes a little thinking about how the shrinking affects the shape of the mural to figure out how to place the tiles…and a lot of squizzying! More to follow. 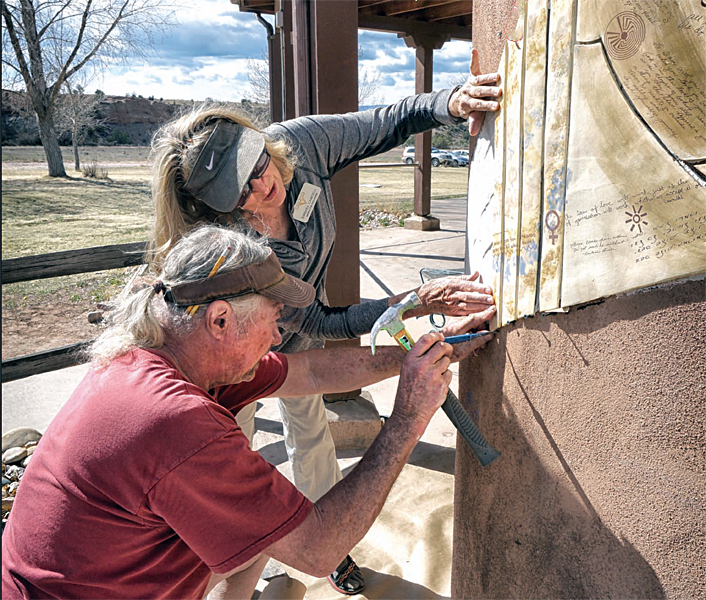 Barbara Campbell, Dean Schroeder, Nancy Brandt, and Judy Nelson-Moore spent March 13-16 at Ghost Ranch applying the decals on the mural. 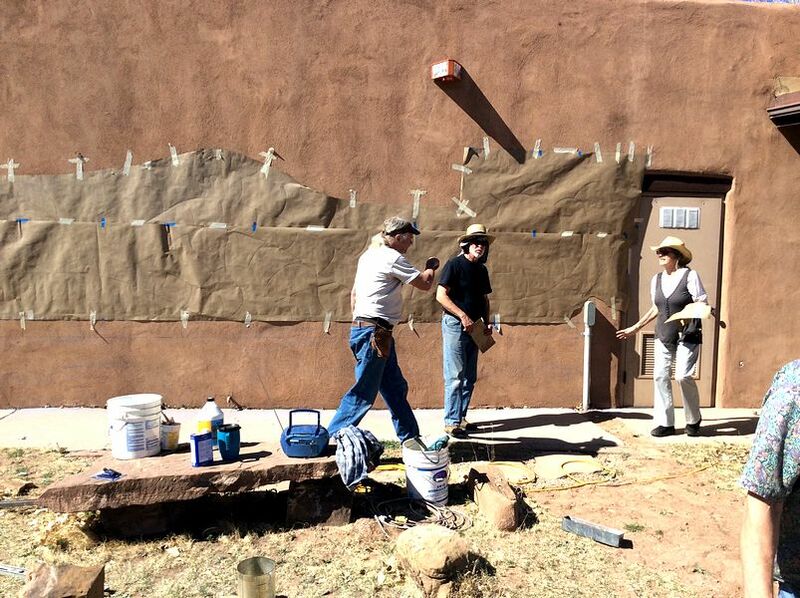 It is exciting to see the final vision emerging. 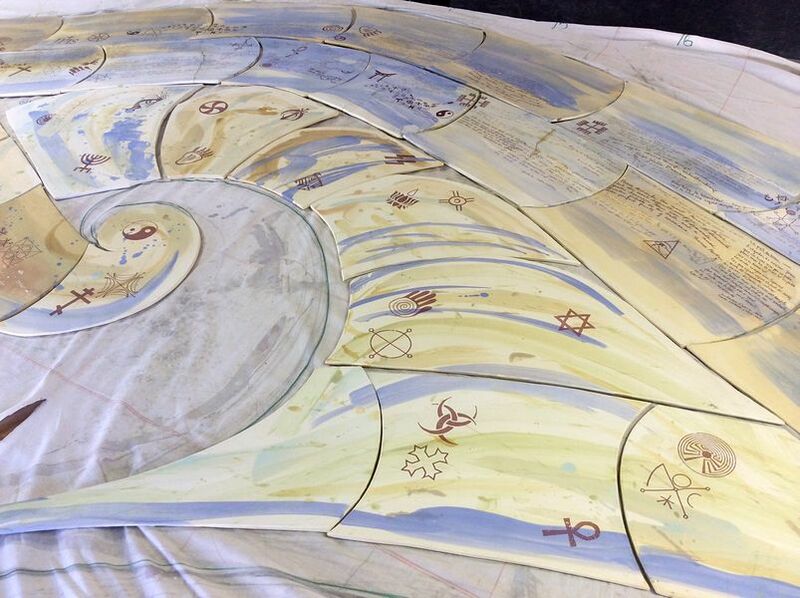 There is still time to get your prayers, poems and intentions to us for the River of Peace. See instructions here. 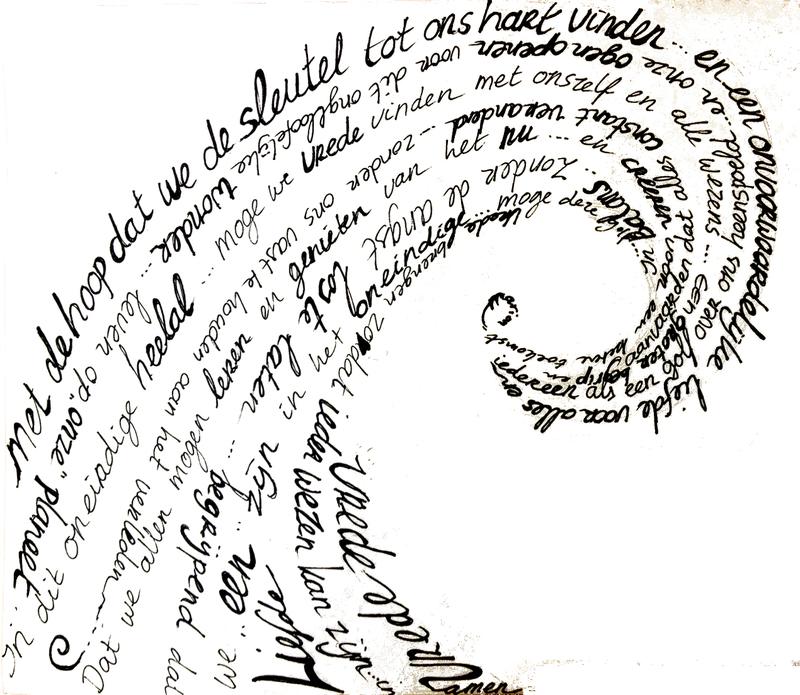 People send amazing stories with their prayers, poems and intentions for the River of Peace. 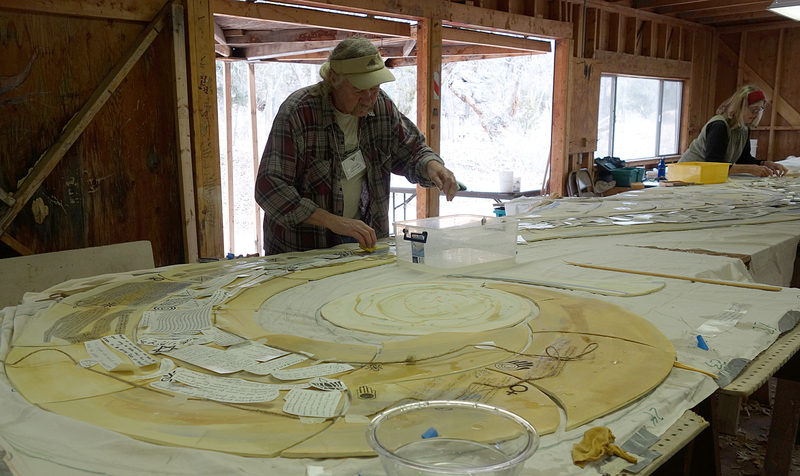 The writings will be translated into ceramic decals and become part of the permanent ceramic mural in the Peace Garden at Ghost Ranch. 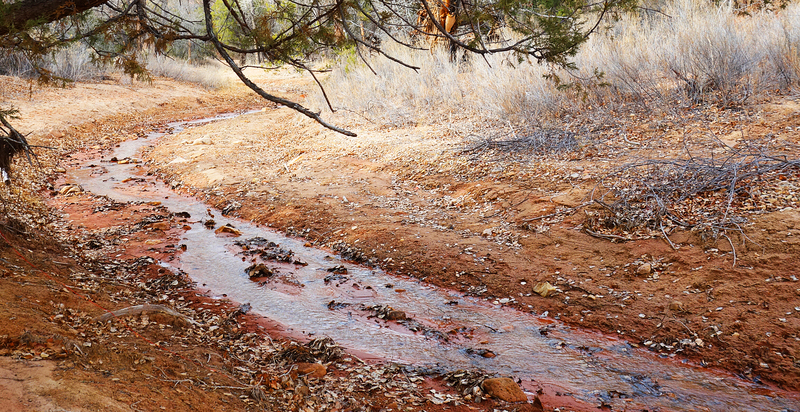 I am also including some of the stories in this blog to expand the story of the “River”. Thank you for being the conduit in connecting prayerful intentions. It is more powerful than I first imagined. 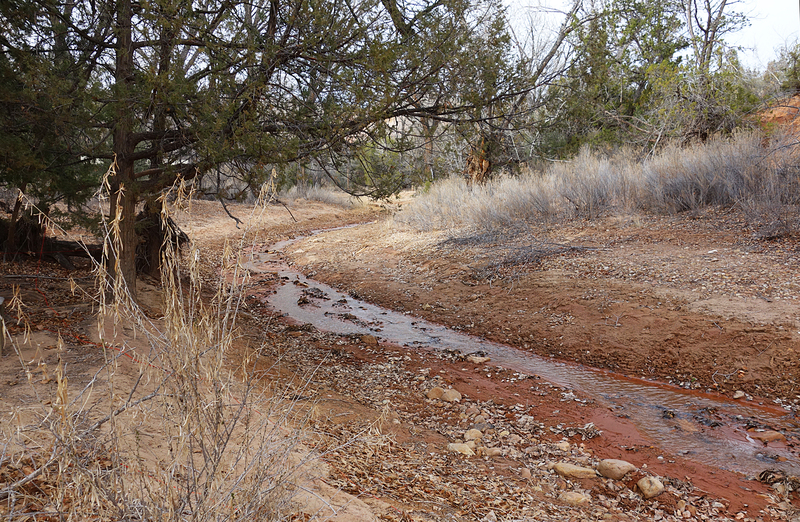 I look forward to spending time appreciating the ‘River of Peace’ in my daily devotion and the beautiful creation being birthed at Ghost Ranch. I also included a picture of my brother Stephen a gifted artist that left an ink drawing there in the cafeteria behind the milk cooler in 2005. 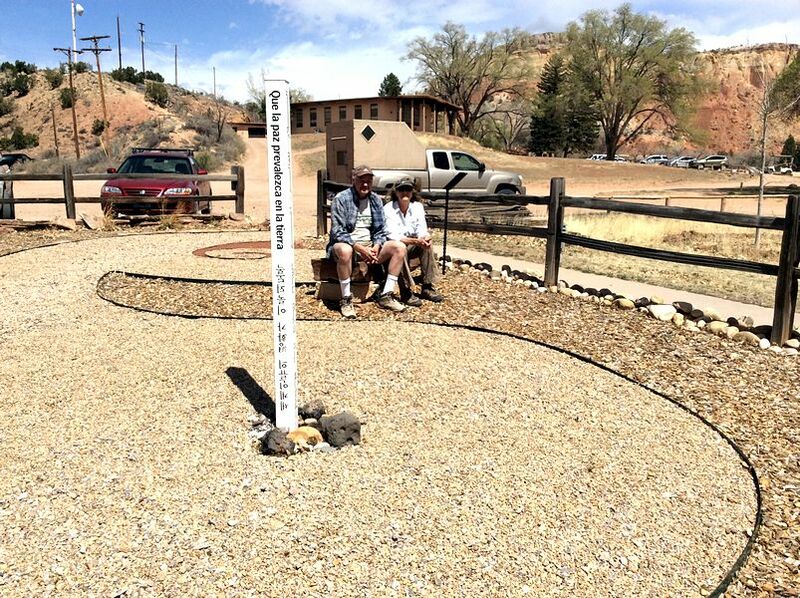 Our son was last seen in January 2006 at Ghost Ranch. He was a wonderful, spiritual artist and he apparently went camping in Abiqui, but we didn’t know where he was. Well, his body was found by hikers in July of 2006. All of our hearts were broken and we missed him terribly. Our youngest daughter found your website and sent it to family members. In his honor and memory, we [add] to the River of Peace. We had this written on his headstone . We can use more River of Peace submissions. The deadline is February 14, 2014: These can be quotes, poems, prayers from other sources or from your own writings. 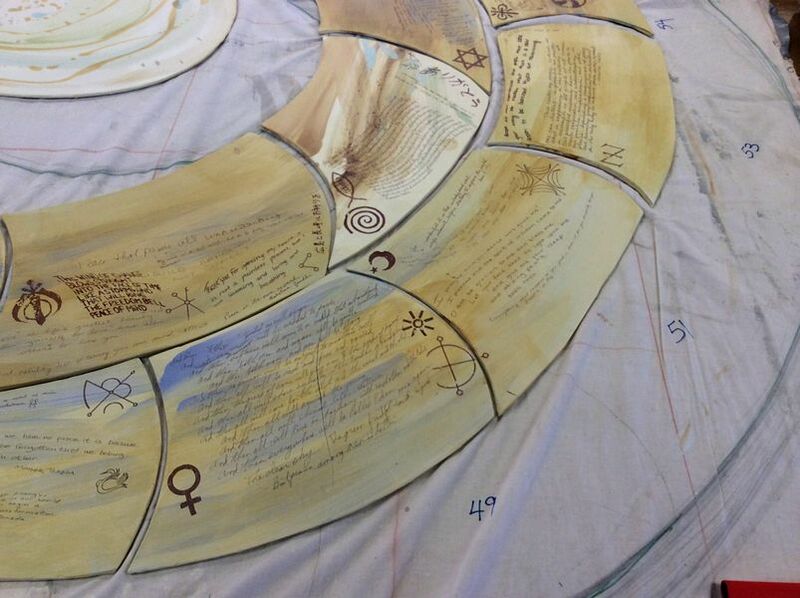 They can be about world peace, inner peace, intentions for our planet, the natural world, or remembrances. Please hand-write in script using a thin black pen on white paper. Use 1/2 sheet of white typing paper. Then, take a photo or scan your submission and email to me at judy@nelson-moore.com. 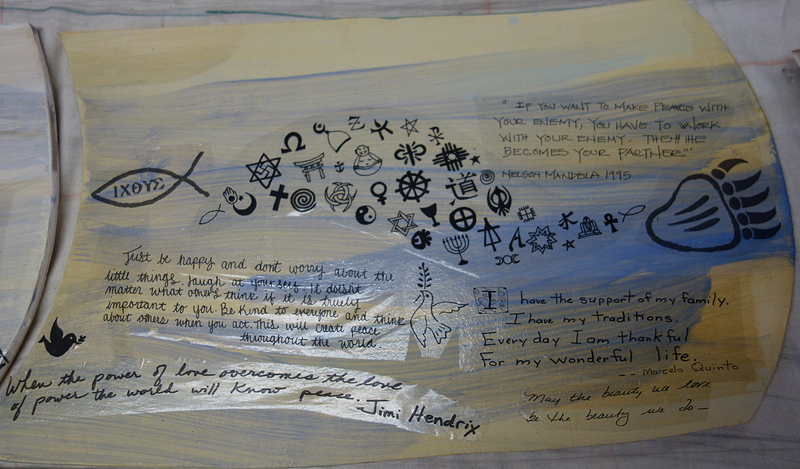 Submissions for the River of Peace are coming in from all over the world. We have extended the deadline for these submissions to February 14, 2014. We wanted to give people more time to get their submissions to us. 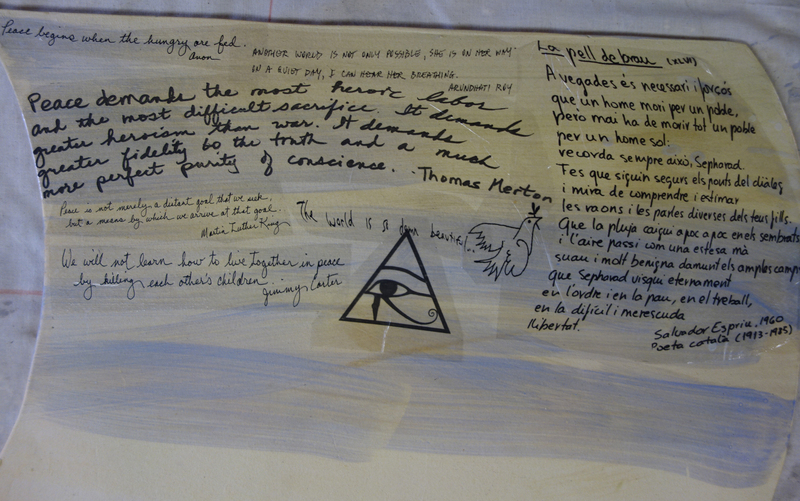 We have less than 30 writings received so far and would like to have closer to 100. The date 02/14/2014 seems like an auspicious date, especially since it is Valentine’s Day, a day to celebrate love. So far the nature of the submissions have varied from original thoughts to quotes from other sources, both of which are welcome. 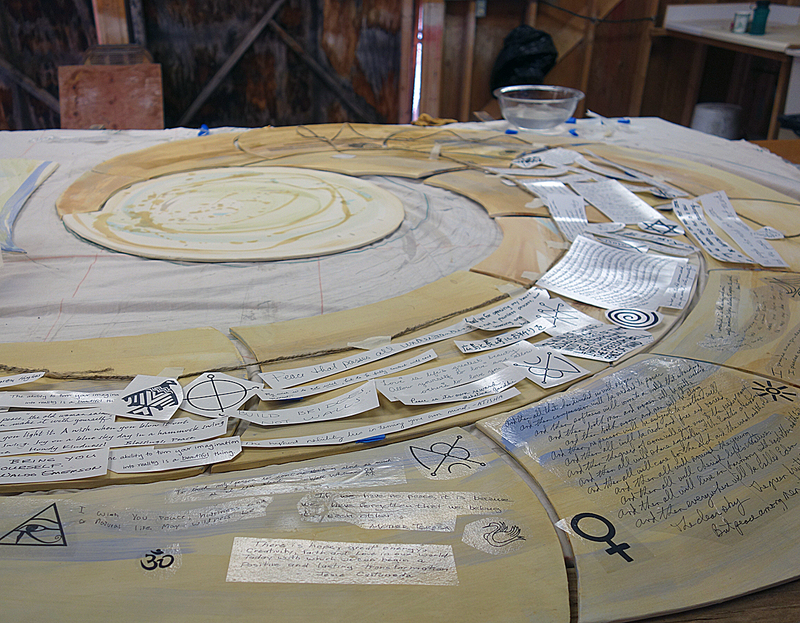 The subjects include peace between nations, races, and cultures, cessation of violence in our workplaces, schools, and communities, caring for the earth and reduction of natural destruction, and ideas conducive or leading to inner personal peace. Last week Morris told me about the river of peace and asked me if I would be willing to write something about peace for your project in Dutch. 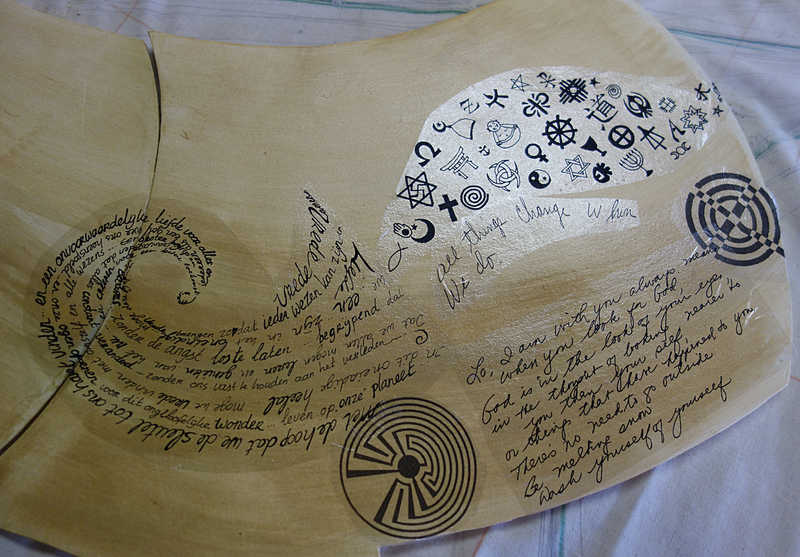 I hope that the little “wave” that I wrote from the heart may contribute to the river. I will give you a little bit of background as for you to understand how close your project is to my heart. 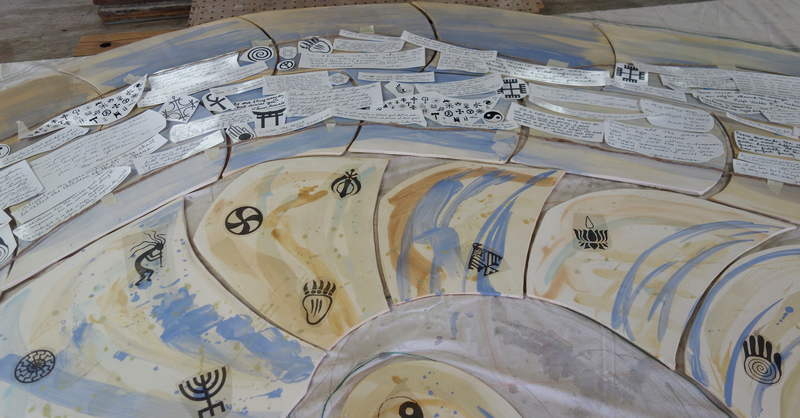 I am an art-teacher in Beir Tuvia high school and retorno a rehab-center of N A, working with kids 15-18 yrs old. I live in Israel was born and raised in Holland-lived in France a bit–volunteered in Israel- traveled “around” lived in NY city – Philly then moved to Montreal – Canada- moved with 2 little children to Israel ! Now 18 years later (exactly on new-years day ) The harsh reality of my son joining the army has arrived. This week at the ” swearing in “ceremony for my son at the Western wall in Jerusalem – I got overwhelmed with mixed emotions – sadness and pride – my son being chosen for this special fighters-unit – Feeling sad to see all those hundreds of boys standing there- holding a weapon, feeling that this is their duty as Israeli boys to protect their country. Besides some strange patriotic pride also skeptical thoughts occupied me – this is absolutely absurd – what kind of mom am I – did I do something wrong – what can I do to spread peace – besides here and there some art projects – talking peace with my students and as a mom – living a peaceful life – being at peace with myself and others – ??? I pray that our eyes will open to this magical planet and still have not lost hope that one day there will be PEACE for all beings on this planet.